Fun Friday – Exploring Bubbles! A bubble is a thin film of liquid filled with air or another gas. Most bubble are made up of soapy water and air. 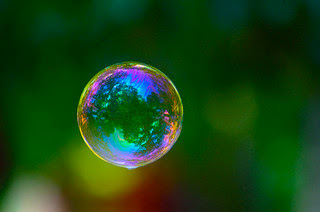 No matter what shape a bubble starts off as, it will always try to form a round shape (called a sphere). A sphere is the shape that allows the least amount of surface area – and therefore the least amount of energy is needed to maintain this shape. 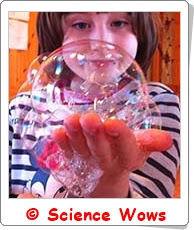 If one or more bubbles touch they will loose their sphere shape – the walls of the touching bubbles will merge. If both bubbles are the same size the shared wall will be flat! WHAT COLOUR IS A BUBBLE? Bubbles reflect colours from their surroundings so at first they may appear rainbow coloured. The sphere of a bubble is made up of two layers – an inner wall and an outer wall. As light waves hit the bubble they are reflect off both walls. The walls of the bubble gradually weaken and the distance between the two walls reduces until the reflected light waves cancel each other out and the colour disappears. 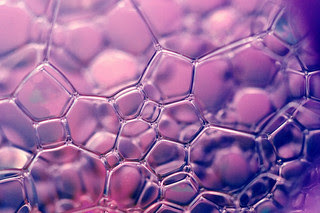 Did you know… The skin of a bubble is less than one thousandth of a millimetre thick! 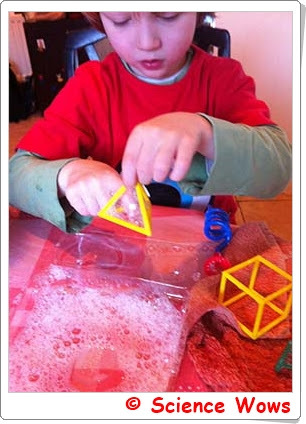 Make your own bubble solution! Commercial bubble solutions are great but they can be expensive, so why not make your own? There are lots of good recipes that work really well but this is the one I usually use! What to do: Before you start make sure the bottle, your hands and any measuring utensils are clean and dry. Carefully measure out each ingredient and add, one by one to the bottle, trying not to make the mixture get too bubbly. Once everything has been added stir slowly and carefully. Cap the bottle and leave it in a safe place overnight. The bubble solution is ready to use the next day. Some tips: When making your bubble solution make sure you use “original” washing-up liquid and not any of the scented varieties! If possible, use bottled or filtered water rather than tap water. So now what?… Now start making bubbles!! If you don‛t have any bubble wands you can make your own using some pipe cleaners. Try shaping the pipe cleaners into different shapes and see how the bubble will still always end up as a sphere shape. Did you know… The biggest free- floating soap bubble ever blown was 105.4 cubic feet. It could have held 788 gallons of water! If you really want to scale it up make extra bubble solution and us a small paddling pool and a hoola hoop to make some mega bubbles! Did you know… The world record for the most people inside a bubble was set in 2006 by Sam Heath; His bubble contained 19 girls and boys over five feet tall!! You will need.. bubble solution, food colouring, plastic cup, a straw, paper. What to do: Pour bubble solution into the plastic cup until the cup is about one third full. Add two tablespoons of food colouring to the bubble solution and mix it well. 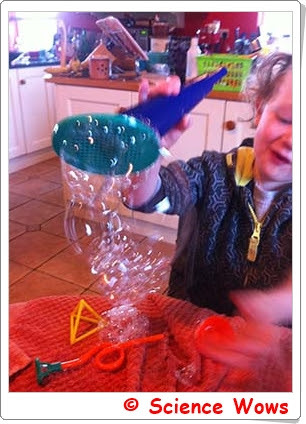 Place the straw into the bubble solution and keep blowing until the bubbles are coming out of the pot. 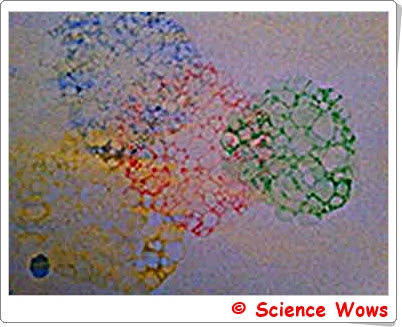 Lower the piece of paper onto the bubbles to make an imprint (do not let the paper touch the plastic cup). Lift off the paper and allow your bubble art to dry. You can repeat the process using different colours of food colouring!